For the most part, people don’t pay much attention to wasps and hornets except when they start to invade the picnic or barbecue. Then the hands start swatting and the homemade wasp traps come out. If the situation is bad enough the next outdoor event will likely feature a few store-bought contraptions designed to take care of that wasp or hornet problem. 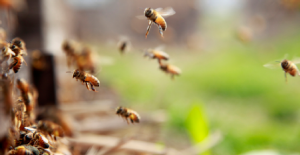 But what do you do when the problem is big next of wasps or hornets tucked up under the eaves of your home, or hidden near the back door of your business. 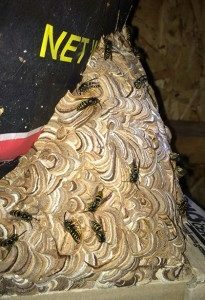 It’s a cinch you don’t want to be tangling with a large nest of angry hornets and wasps because that’s just asking for trouble, and that’s the time you should be calling in Perth’s leading wasp control and hornet control experts, Frank Gilmour Pest Control Perth. Wasp control and hornet control both begin with understanding the “enemy.” Neither of these pests is high on the list of favourite picnic attendees, but keep in mind that wasps and hornets aren’t out to get you… they’re just going about their business looking for food so they can feed themselves and the hive, and so they can live long enough to procreate. To beat the enemy, you must know the enemy, and that means knowing about the most common wasp types in the Greater Perth area – European and native paper wasps (also known as umbrella wasps), yellowjackets and so-called bald-faced hornets. Other types to be found are mason or potter wasps and a number of other less common varieties that humans don’t notice as often because they’re not as “in your face” as the more common varieties. While hornets are commonly thought to be different from wasps, in fact they’re just a larger-sized sub-set of the wasp family. Like yellowjackets and paper wasps, hornets are social creatures, which means they live in hives. The only difference is in the number of roommates they have, as paper wasps tend to number a dozen or so to a nest, while hornets and yellowjackets can grow their nests to as many as four or five thousand individuals. Needless to say, the thought of 5,000 hornets buzzing around your home or business is likely to give you some serious nightmares. The European paper wasp (umbrella wasp) is a relative newcomer to WA, and is often confused with the native paper wasp and the yellowjacket. It has a more slender body with longer legs, but like it’s cousin it still has a stinger that doesn’t quit. 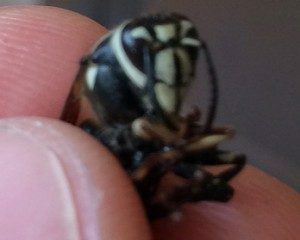 The sting from a paper wasp is not as painful however as the bald faced hornet or yellowjacket. Yellowjackets are often confused with bees because they’re about the same size, but the similarities pretty much stop there. They don’t have pollen carrying capacities, they hunt for meat to take home to the larvae, and their stingers can sting repeatedly for defense. Hornets are the largest of the trio, and the ones in WA are usually identifiable by their striking black and white ‘bald face’ – hence the name bald-faced hornet. Like the other two on this list, the bald-faced hornet can sting repeatedly. In the world of Greater Perth’s wasps, the life cycle is pretty standard for the three varieties talked about in this article. A queen goes dormant in the winter months, and emerges from her hiding place in the spring when the weather warms up. She selects a place to begin a nest, gets it far enough along that she can lay her first eggs, then feeds her first group of larvae to the point that they can begin the process of expanding the nest – typically the papery-looking football-like structures that are so common under the eaves of homes. Sometimes the nest is located inside an alcove, or in a tree, or any place that is somewhat sheltered from the elements. The queen continues to lay eggs while the workers guard the nest, expand it, and feed the young. The drones, males developed from unfertilized eggs, will have one job come fall – to mate with the new queens that are hatched at that time of year. When mating season is done, all but the new queens die, the nest is abandoned, most likely never to be re-used, and the queens go into hibernation once more. The three wasp varieties mentioned here eat a variety of foods. Workers eat nectar, tree sap and fruit pulp (apples are particularly delicious to hornets, while European paper wasps are an expensive nuisance to Okanagan cherry and grape growers). Generally anything with sugar and carbohydrates is sought out as a welcome part of the wasp diet. For many people, one of the most interesting things about wasps is that they’re attracted to meat and fish, hence the name “meat bees.” However, the wasps that collect the meat aren’t actually eating it themselves… they’re taking it back to the nest for the larvae to feed on. It’s actually an efficient exchange because the workers prepare the protein by chewing and conditioning the meat for the larvae, which in turn secrete a sugary substance that is eaten by the adults. Now, while meat forms the diet for the larvae, it should be pointed out that the vast majority of this foodstuff is gathered as a result of the wasps hunting and killing other insects; the steak at your barbecue is just an added opportunity. Which brings us to interactions with humans. 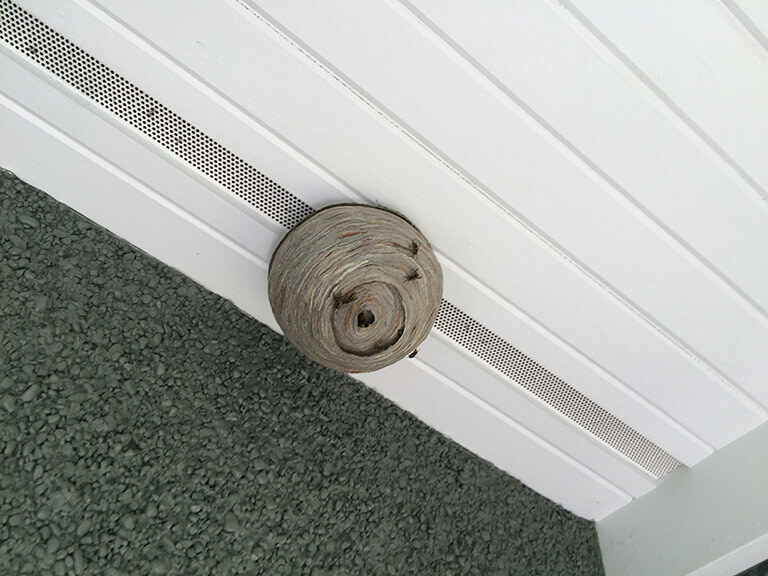 All three of these wasp types are prone to building nests near human habitation, which is why wasp control services are so widely called up in all Perth metro and country area. 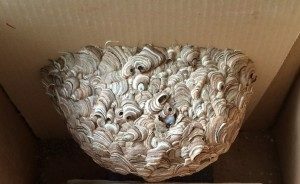 Huge dormant wasp nest removed from an attic. The nest was almost 3 feet wide! Beginning in spring – as early as September and October – the phones start ringing at Perth’s premier wasp control company. 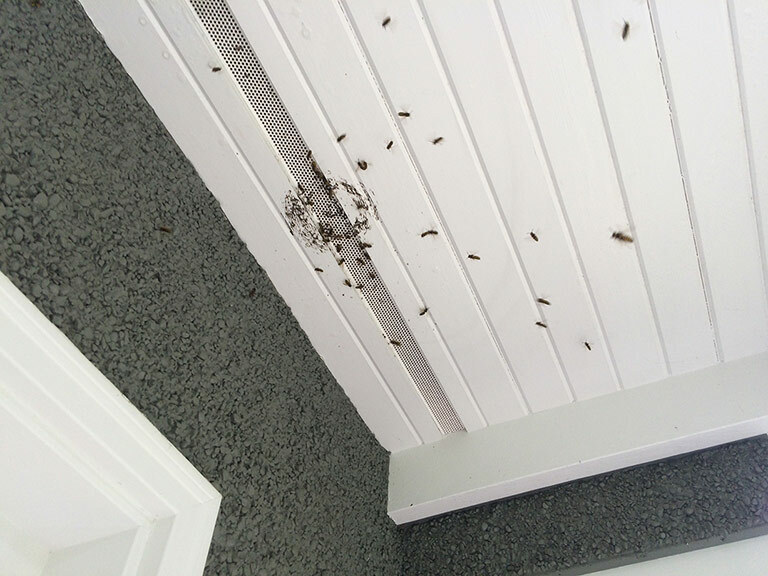 Frank Gilmour Pest Control Perth takes hundreds of calls every spring and summer when the wasps are in full flight. The nests start popping up everywhere, and if they’re not tackled early they just keep growing, becoming a bigger threat to people and their pets with every new batch of workers. 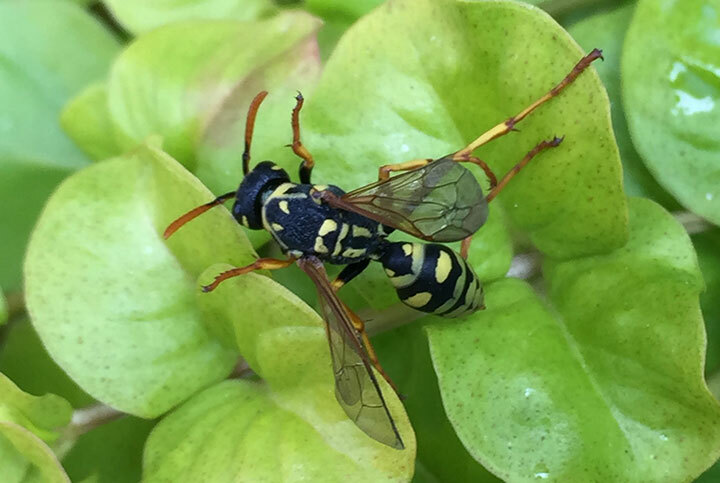 Hornet control, yellowjacket control and paper wasp control is best started as soon as a nest is detected. If it’s small enough, with just a few wasps involved, many brave homeowners or businesspeople will probably tackle the nest on their own. Knocking it down with a broom into a bucket and covering it over quickly so you can move it somewhere safer before releasing the insects is pretty efficient. As long as you’re careful, and as long as you can duck inside quickly should the irate wasps come after you, you should be okay. However, if you’re allergic to stinging insects, or aren’t confident in your ability to escape the attack of an agitated wasp, don’t try this method. Remember, a wasp stinger isn’t like a bee’s stinger; it can do damage more than once, and wasp poison can cause reactions in humans and pets ranging from acute irritation all the way up to hospitalization and death. Therefore, the much safer route to go when it comes to wasp or hornet control is to call in the professionals at Frank Gilmour Pest Control Perth. We have the knowledge and the equipment to deal with wasps efficiently and safely because we’ve been dealing with the critters since 2009. 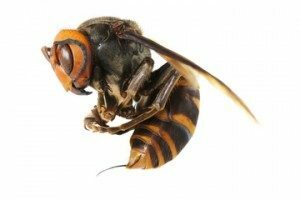 As one of the best wasp control companies in Perth and the surrounding communities, Frank Gilmour Pest Control Perth is completely professional in its approach to taking care of hornets, yellowjackets and paper wasps at your home or business. All of our employees are trained and certified in all of the products and equipment we use, and we’re always focused on safety. Just as importantly, we focus on customer service, which means we’re not happy until you’re happy. Courteous interactions with our customers and effective results ensure we’re number one on the speed dials of satisfied clients when it comes to wasp control, or pest control of any kind. So, if you’re having problems with wasps of whatever variety, call Frank Gilmour Pest Control Perth and put us to work. We’re more than happy to help, and we’ll do the job well for a fair price, and we’ll do it with a smile. After a few simple questions, free estimates can be given over the phone for wasp control in Perth and the rest of the Lower Mainland. Call the Perth Pest Control experts now at 0416334479 or contact Frank Gilmour Pest Control Perth by email.